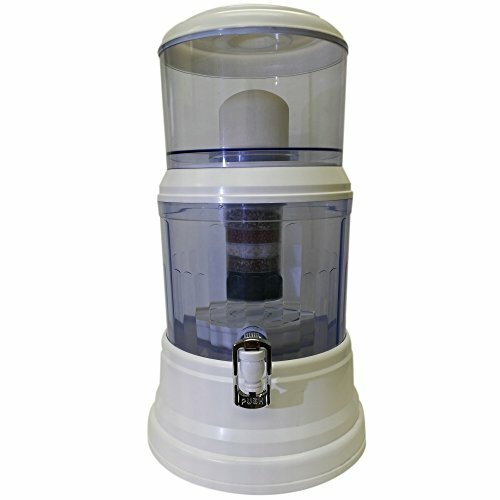 Zen Water System transforms ordinary tap water to clean, delicious, alkaline mineral water. This system uniquely combines 5 different functions into 1 system: 1.) Filter; 2.) Purify; 3.) Alkalize; 4.) Mineralize; 5.) Magnetize. The benefits are endless. The Micro-Ceramic Filter contains millions of tiny pores that measure 0.2 to 0.5 micron in size, which removes up to 99% bacteria, trap harmful contaminants, parasites and effectively reduce manmade chemicals, pesticides, herbicides and toxins. 5-Stage Mineral Filter Cartridge contains activated carbon which purifies your drinking water by eliminating bad taste and foul odor, leaving water crispy clean with a mountain spring fresh flavor. The silica sand contains superb absorbent qualities to remove impurities in the body and is known to aid in the formation and strengthening of connective tissues. The far-infrared ceramic balls are commonly used in alternative medicine to increase enzyme activity in digestive tract, improve memory function, regulate blood pressure, boost metabolism, strength and vitality. 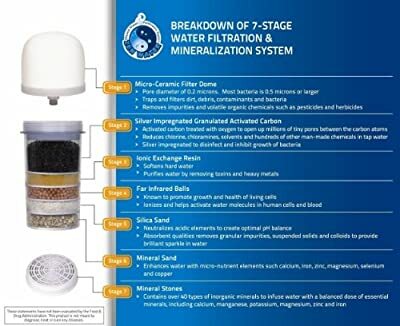 Mafia Mineral Stones infuse water with micro-nutrients and essential minerals such as calcium, zinc, potassium, manganese and increase alkalinity of water. Zen Water is eco-friendly and BPA-Free. It requires no electricity or plumbing and operates purely on gravity. No more bottled water and plastic waste. The system is compact, portable and pays for itself in about less than 2 months time. Turn your dirty tap water into healthy, delicious mineral water at your fingertip. Get one for the office or the cabin. Keep one handy for emergency or natural disaster. Capacity: Top holding tank is 1.5-gallon; Bottom storage tank is 2.5-gallon. Filter life: Ceramic filter is 1,000 gallons or 1 year; 5-Stage Filter is 500 gallons or 6 months; Mafia Mineral Stones is 3 to 5 years. System can be used with or without the base. Not recommended for use with microbiologically unsafe water.